Today we get to know Connie Yun, our lighting designer for Orphée et Eurydice. She's previously lit Attila and Don Quichotte for Seattle Opera, and has been working with the company going back to the 2001 Ring. In our Q&A with her, she tells us from where she drew her inspiration for her Orphée design, why she prefers the original myth to Gluck's take, and about some of the special challenges posed by this production. Orphée et Eurydice prominently features dance. Is lighting dancers different from lighting singers? It is. If you have a lot of dancing or body movement on stage, it’s very helpful to have the lighting come at it from a much lower angle, so you have a more sculptural quality to the shapes on stage. Dance is more about the shape of the body. But that can be tricky for singers, because it means the light is much more on the plane of their eyes, so it can be harder for them to see their surroundings. So you definitely need to find the right balance between how much of that body-sculpting light you can use while still having people navigate the stage safely. Dancers Marissa Quimby and Demetrius Tabron in Seattle Opera's production of Orphée et Eurydice. Do you prefer lighting something more realistic, or something more dreamlike? I think they each have a different quality and role in opera. I don’t think I prefer one over the other, necessarily, because I think you can do both in a beautifully-designed way and facilitate the show. Certainly, a more abstract, dreamy kind of scene gives you more license to do different things—but that’s not necessarily better or worse. I think it’s more about finding the right quality of light in each circumstance that tells the story best, and both types of scenes ask the same questions, though you may come up with different answers. Where did you draw your inspiration from for this production of Orphée? I feel that the research we did helped us delve into the emotions. I won’t say I took any visual inspiration from looking at interpretations of Orpheus in film or images, but it helped develop a sense of how I felt about the characters. Visually, all the designers took a lot of inspiration from various photographs of nature. There’s definitely a strong component of a heightened sense of nature that we’re all drawing on for this piece. So Andy Goldsworthy was a big inspiration for us, and I feel like I spent a lot of time on the National Geographic website looking up photos. We were looking for strong, simple, minimalistic, bold choices. When we first began our design meetings, stage director Jose Maria Condemi brought a ton of images that we sifted through and we talked about what compelled us to those images. 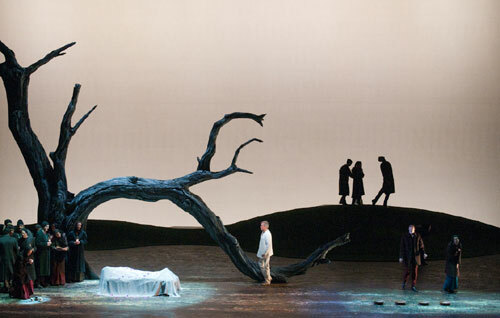 The opening scene of Seattle Opera's current production of Orphée et Eurydice. 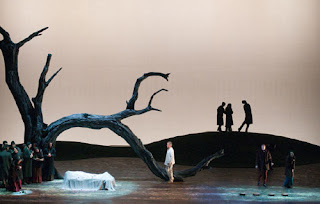 What role do projections have in your work, both in Orphée and in your work as a lighting designer, in general? We do have projections ready for the show, and if we use them at all, they will be much more a lighting and textural effect. The nice thing about projections is sometimes we can use them to do a graphic image or a full-stage picture of something—for instance, in Attila quite recently we used projection to show the logos of various factions that were fighting, or we’d overlay a completely different visual scene on top of the existing scenery; what was an architectural wall now looks like forest trees or Roman ruins. That’s definitely a more obvious use of projections. But here we might use them to lay on top of the deck surface so we have the ability to take it into a different textural quality. Or we could lay an abstracted version of fire for the Hades scene, or an abstracted version of the roots and tangles during a later scene. There are some options we can play with. That’s not to say we will use projections for every scene, but it’s one more tool in our tool box that we can add onto the show if it’s something that’s appropriate. 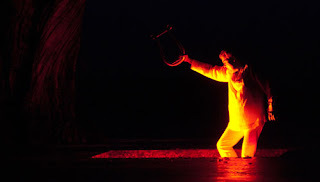 Orphée (William Burden) descends into the underworld. Tell us about your musical background. How has it helped your work as a lighting designer? I studied classical violin for nine years as a child. That was great for me, because it definitely immersed me in the culture of classical music and opera. My violin teacher was the wife of one of the violinists in the Metropolitan Opera’s orchestra at the time, so she’d sometimes give us tickets to go see the opera, which was great. Being able to read music has been a great asset for me now, so that’s been helpful. Did you ever want to pursue a career in music? No, no, not at all. Learning the violin was something my parents put upon myself and my brother. They insisted we both take music lessons, and I was always a very reluctant musician. I was never very good at it, mostly because I didn’t practice very much. But I did learn a lot, so—much to my chagrin—they were right. [Laughs] It was actually a very useful education for me, and now I sort of wish I had taken more time to become a better violinist, because sometimes I miss being able to play. Maybe one day I’ll go back to it. 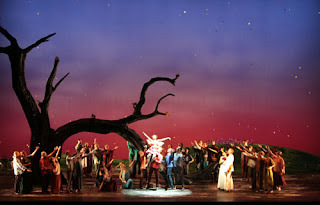 Eurydice (Davinia Rodríguez) in the Elysian Fields. How did you first become interested in lighting? I sang in a couple musicals in high school—but I wasn’t very musical, so I started heading backstage. 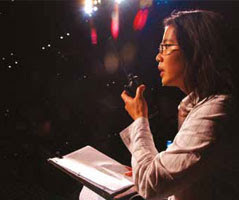 In high school, the drama teacher had a falling out with some of the members of the senior class who had been involved in some of the productions, and she basically promoted a lot of the new people into higher positions. When I came in as a freshman, she threw me right onto the lighting console and said, “You’re going to run the board for the next show.” So it started right there in high school. After that, I went to the University of Virginia and I originally thought I was going to study drama, but I ended up switching to English literature. It was nice to have a combination of experience, because I also worked in the drama department’s shops and did summer internships. That, along with the academic background of learning how to read something carefully and how to analytically look at a piece of literature, or a script, or an opera score, was definitely a good for me. We’ve been asking several of our artists this question, and would love to hear your thoughts: What does the story of Orpheus mean to you? Well, I like the original Orpheus myth where Eurydice does not come back, because I think that’s a much more honest telling of what happens in life and death. What I really get out of the story is that there’s a cyclical nature to life and death, and you’ve just got to go on and persevere. I feel Orphée et Eurydice kind of has a Hollywood ending—but even with her coming back to life, there is still a sense that death is a part of living and you have to learn to deal with it. And the music is very glorious at the end, so you do come out of this opera feeling kind of rejuvenated and reborn, which is a marvelous thing. Still, I’m just a sucker for tragedies. Seattle Opera's production of Orphée et Eurydice. For more with Connie Yun, read our Staff Chat with her here.